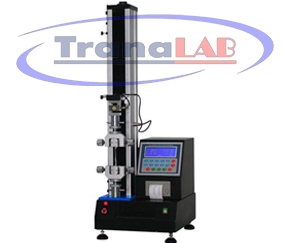 Digital Type Universal Testing Machine a simple type machine, simple structure, convenient operation, It can be tested on the operated table, Using the electronic control systems, load sensor is rising and falling to test the tension or compression through the motor rotation, transmission machinery and T-screws. This machine is simple to operate, especially suitable for controlling quality in production line, This series of machine is mainly applied to test the non-metallic and metallic materials which the load is less than 1KN. This machine can be test all the material in tensile, compression, bending, shear, peel, tear, two-point extended (need add extensometer) and others for control products quality. Such as textile, rubber, plastics, synthetic leather, tape, adhesive, plastic film, composite materials, electronics, metals and other materials. Single measurement, it can record the max force of tension and compression in both directions, automatic or manual cleared to zero. Structure of single-column is beautiful and sophisticated, seating operation, relaxation and nature. KG,N,LB, TON can be exchanged. Machine with thermal printers can automatically output the testing results. Can store 10 testing results and auto-calculate its average, auto-grab maximum force and the force at break. blue LCD display, membrane touch keys, with the following functions. realizing stop machine at any position. The system would shut down if overload or over-trip. column shell is made of aluminum material. It is widely used in wire and cable, hardware, electronic and electrical equipment, packaging, printing, medical equipment, auto parts, textiles and leather, clothing, shoes, rubber and plastic products, colleges and universities; research laboratories; inspection arbitration, technical supervision departments and many other industries, it is the basic equipment for quality management and physical tested.